Some great multimedia coverage as US President Barack Obama completes his first 100 days in power. The Washington Post has set up a ‘special package’ to mark the day – complete with videos, more than 300 photos arranged by topic (see below) and an interactive timeline of the period – with symbols marking the days key legislation was introduced. Similarly, the LA Times has its own 100 days site with the emphasis on readers’ views. The Times asked commuters for their video thoughts on Obama’s progress so far. What I like in particular about this effort is the ability to filter videos by policy and the interactive calendar that dominates the top of the page – click on any date from the 100 for more information. It’s a very clean layout with a nice feed of LA Times’ related articles too. 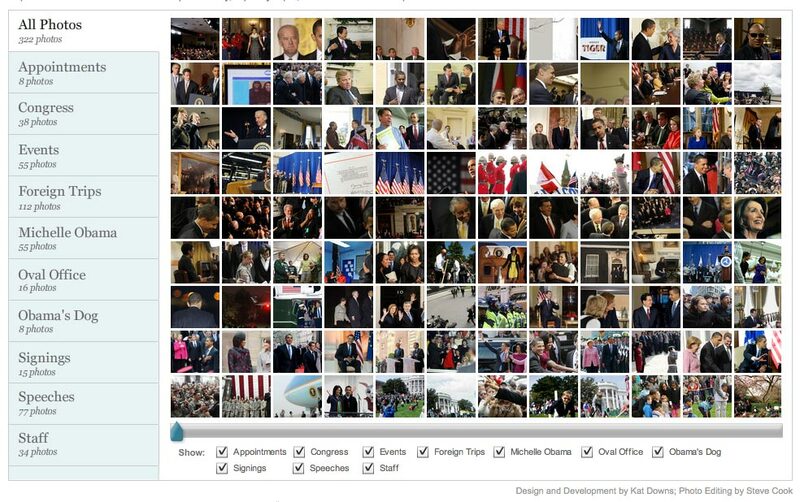 The White House is getting in on the act too with its own Flickr group of images depicting the start of the presidency. Any more good examples of coverage? Am reliably informed by Daylife that they’re not behind the Times’ photos – it’s being done internally – but their technology has had a hand in the Wall Street Journal’s coverage, which pulls together video, relevant articles, images and create interactive graphics. Also enjoyed Slate highlighting the 100 days on Obama’s Facebook feed. This entry was posted in Multimedia and tagged Barack Obama, LA Times, President, the LA Times, the Olympics, The Times, The Wall Street Journal, The Washington Post, The Washington Post Company, United States, Wall Street Journal, White House on April 29, 2009 by Laura Oliver.